TEMPE, Ariz., January 15, 2010 – Flow Technology, Inc. (FTI), a leading manufacturer of precision flow measurement instruments, systems and calibrators, today announced the FT-HE (Heavy Equipment) turbine flow meter solution for hydraulic fluid applications. The company’s FT Series turbine meters are now offered with SAE J1453 fittings with O-ring face seal, which simplifies installation in hydraulic lines onboard tractors, combines and other heavy equipment. In the off-road industry, there is an increasing emphasis on reducing both the number of potential leakage points and the incidence of leakage from hydraulics systems on machinery. This requirement is addressed by the SAE J1453 standard covering material, dimensional, and performance requirements of steel O-ring face seal fittings for hydraulic tubing, as well as the O-ring face seal interface and nut portion of hose stem assemblies. The FT-HE solution provides accurate and repeatable flow measurements in a host of hydraulic and pneumatic applications. Unlike flow meters equipped with NPT end-fitting, units employing SAE J1453 flat-face male-to-male fittings do not require adapters for use in off-road equipment hydraulic lines. This approach significantly reduces the space required for meter installation and ensures fewer possible leakage points in the hydraulic system. 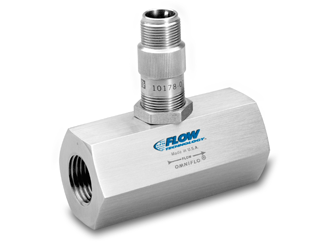 Flow Technology’s FT Series turbine flow meters are an ideal choice when high accuracy, compact size and fast response are critical. They utilize a proven flow measurement technology to deliver exceptionally precise and reliable digital outputs. Because of their versatility, these meters are the solution for a wide variety of liquid and gas flow sensing applications. FT-HE turbine meters are available for up to 1-1/2-inch line sizes and are offered in both standard and high-shock (HS) configurations. The SAE J1453 fittings are intended for general applications and hydraulic systems on indusial equipment and commercial products, where elastomeric seals are acceptable to overcome leakage and variations in assembly procedures. These fittings are capable of providing leak-proof full flow connections in hydraulic systems operating from 95 kPa (28 in Hg) vacuum to working pressures. For more information about the FT-HE solution, please visit https://ftimeters.com.